Do you want to make a billion dollars? We’ll tell you how: Invent a drug that builds and sculpts every muscle in your body perfectly in one dose. One pill, and you’ll look like Arnold Schwarzenegger or Jillian Michaels. If only it were that easy. The unfortunate reality of exercise is that even if you use steroids, you’re going to have to make working out a habit. Storytelling is no different. Sure, you can change people’s minds with one story. You can reword a beggar’s sign and get people to give more money. But if you want to build a long-term relationship—as a business or in everyday life—you’re going to need to think of storytelling like going to the gym. If you’ve made it this far, you’re probably convinced that you should be using stories more to build relationships. But it’s not always easy to convince an entire organization to start going to the gym, so to speak. Let’s explore a few specific ideas for how you can make the case for stories inside your company. Ten years ago, it was possible for one person to make content work for an entire organization. That’s no longer the case. Today, you need real support internally. It won’t necessarily happen all at once, but it’s the first step you have to take. And while it’s not easy, it pays off. Let’s look at how Marriott’s content marketing program got started. Ten years ago, Kathleen Matthews, the hotel giant’s executive vice president of communications, walked into Bill Marriott’s office with an idea. She’d spent 25 years as a reporter and news anchor for an ABC News affiliate in Washington, DC, and she knew the power of a good story, especially when it came from a compelling figure. She wanted Marriott to have a blog. And she wanted Bill Marriott to write it. “Why the heck would anyone want to read a blog from me?” Marriott, then 76 years old, responded. Matthews quickly convinced Marriott he was the best person to tell the company’s story, even though he didn’t even use a computer. So they struck a compromise. Marriott would dictate a blog post once a week. And so, Marriott’s digital storytelling journey began. It started with those simple blog posts, but over the next seven years, their efforts grew exponentially. Before long, they were operating a full-fledged global media company. In the next three years, Marriott launched a popular digital travel magazine, Marriott Traveler, that covers cities from Seattle to Seoul. It has built content studios on five different continents. And it’s even won Emmys for its short films like Two Bellman and French Kiss. When you walk into the ground floor of Marriott’s headquarters, it fittingly looks like the lobby of a modern hotel. There are chic white lounges and cozy pods. A friendly receptionist welcomes you. But then you notice something unexpected. In the middle of the lobby, there are nine flashing screens encased in glass walls, like a TV control room that’s been teleported from Hollywood to Bethesda, Maryland. In a way, it has. Inside the control room—dubbed “M Live”—typically sit various media veterans tasked with seeing just how much a hotel brand could capitalize on the new opportunities digital media gave Marriott to tell their story. “We are a media company now,” Emmy-winner David Beebe, then Marriott’s vice president of global creative, told us. It’s a big statement, but one that Marriott’s content production backs up. Which raises the question: How did Marriott evolve from a single woman—Kathleen Matthews— storming into the CEO’s office and advocating for content to one of the most advanced content marketing operations in the world? Well, after a few years, Bill Marriott’s blog took off. 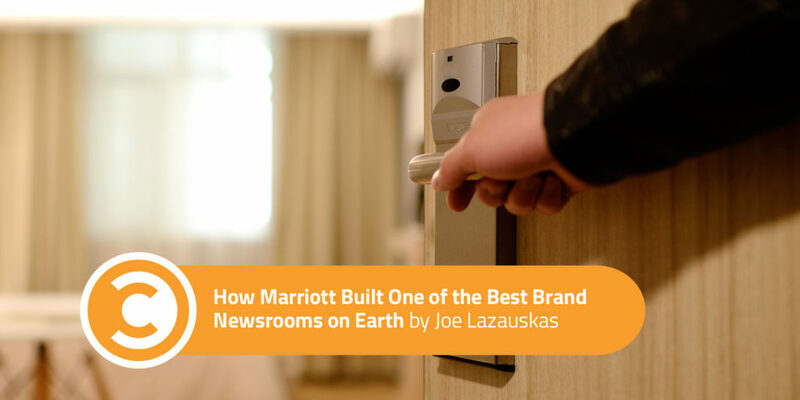 And before long, he was convinced that content was the answer to the challenges Marriott faced in telling the story of a company that spanned almost two dozen different hotel brands. So in 2013, Marriott made a big bet and hired Karin Timpone away from the Walt Disney Company, where she had led the launch of successful digital products like WATCH ABC, so she could connect Marriott to the “next generation of travelers.” In June 2014, Beebe, who was also working for Disney, followed Timpone. Beebe and Timpone got to work fast. By early 2015, Marriott had created a successful TV show, The Navigator Live; a hit short film, Two Bellmen; a personalized online travel magazine; and some exciting forays into virtual reality with Oculus Rift. These projects generated immediate returns, from high viewer engagement to millions of dollars in direct revenue and even content-licensing deals. They helped the company build stronger relationships with its customers. After these initial wins, the company doubled down on storytelling even more and beefed up its in-house staff, bringing in folks from CBS, Variety, and other media powerhouses. They also joined forces with a wide range of outside creators—(including Contently! )—from famed producers Ian Sander and Kim Moses to YouTube celebrity Taryn Southern, who stars in a web series called Do Not Disturb in which she interviews celebrities in their hotel rooms. Beebe rejected the temptation to insert any overt Marriott branding. When he got the first cut back from Marriott’s wonderful short film, Two Bellmen, for instance, his first note was to take out most of the brand plugs. In other words, Marriott bet on having career storytellers lead their content marketing program—not career marketers. The key to making this work, however, wasn’t by shutting marketing out. Instead, Marriott found success by breaking down silos and gathering marketers and content people around a common cause. The key to that is M Live, its glass-encased content studio. Launched in October 2015, the studio has nine screens showing everything from the social media campaigns of Marriott’s 19 brands to real-time booking information to Marriott’s editorial calendar. But what might be even more impressive—and instructive for other brands—are the eight swivel chairs. Each seat in the glass room represents a different department such as PR/Comms, Social Media, Buzz Marketing, Creative + Content, and even one for MEC, a media- buying agency that amplifies well-performing content at a moment’s notice. Some marketers may dismiss this scene as a fad—a foolish brand playing media company. But in truth, it’s actually the sign of a great storytelling culture—one that embraces media as marketing. At the time of this writing, although Marriott is very much building a media business—with plans to license short films and webisodes to places like Yahoo!, AOL, Hulu, Netflix, and Amazon—M Live and the Marriott Content Studio are still very much a marketing initiative. While M Live and the Marriott Content Studio are making great strides reaching people externally, they’re also having an impact on life inside the company. The content team has put in hard work evangelizing and explaining what they’re doing—part of the reason they built M Live smack in the middle of the lobby for all to see. Even Bill Marriott comes down to see what’s going on. It’s that support from Bill Marriott and CEO Arne Sorenson that’s pushed the ambitious content operation forward so it can keep transforming the company. Not every company needs to build a sophisticated content studio like Marriott to build a great culture of storytelling, but if they want to succeed as storytellers in the future, they do need to embrace what that studio represents—the destruction of silos and the shared goal of using stories to build relationships and make people care. Which is, of course, is what marketing is all about. 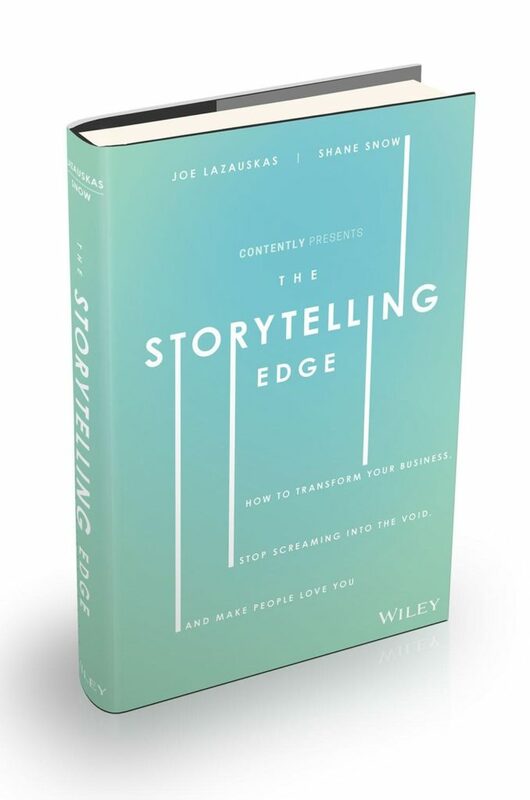 This is an excerpt from the Amazon #1 New Release, The Storytelling Edge: How to Transform Your Business, Stop Screaming Into the Void, and Make People Love You” by Joe Lazauskas and Shane Snow, available today.